Oil: Will the barrel stop rolling? Oil: Will the barrel stop rolling? Oil: Will the barrel stop rolling? Much to everyone’s relief, oil prices eased off during the last week by more than 5% (Brent Oil Futures for December delivery moved below the $80/bbl mark on Friday) from a week’s before four year high of $86.2/bbl, coming on the back of a surprise buildup in U.S. crude inventories (U.S. crude stockpiles rose by 6 million barrels and gasoline inventories jumped 1 million barrels) and verbal assurances by both Russia and Saudi Arabia over the last couple of days on covering up for the lost supply from Iran. Markets have also reacted to reports that the US is considering granting waivers to some countries against sanctions on Iran’s oil exports (though the US has ruled out using the strategic oil reserves), somewhat easing market concerns over tighter crude supply next month. However, as we write this piece on Tuesday, the 16th of October, prices have moved up again (Futures for Dec delivery edged up 2.4% from Friday’s intra-day low of $79.2/bbl to the current price of $81.1/bbl), which just goes to confirm the fact that the only constant in the oil market is change. This is on the back of the ongoing spat between the US and the Saudi Arabia over the disappearance of a Washington Post columnist Jamal Khashoggi in early October from the Saudi Consulate in Istanbul. As events unfold (the US Secretary of State Mike Pompeo is to meet Saudi King Salman), there are chances that the ongoing controversy may bloom into a bigger risk for the oil markets. Whether the Saudi will use the curbs on oil supply to combat the extreme measures threatened by the US or not? And how much can the US ultimately extend diplomatic pressure on the Saudi – are some of the unknowns. These are likely to define the course of oil prices over the next couple of days. As of now, our reading is that the tensions will likely diffuse in which case oil prices are likely to trade within our targeted range of $78/bbl – $85/bbl. But if the spat escalates, we could see a sharp spike in oil prices even beyond the $85/bbl mark. On the demand side, recent rout in the equity market across the globe are exacerbating fears about slower global growth and weakening oil demand amid trade tensions. According to the U.S. Census Bureau data, for the first time since 2016, China imported zero barrels of US crude in August. Chinese imports represented 23% of total U.S. crude exports in 2017 and averaged 22% this year–until August. Prima facie, these developments suggest that the pullback (from $85/bbl levels) in oil prices may be sustained. But many of these factors are either uncertain (whether US will actually grant waivers or not) or temporary. For instance, a build-up in crude inventories in the US could be due to seasonal factors. Refineries are currently in their maintenance mode and hence not taking in as much crude. Our sense is that markets are likely to remain highly speculative until clarity emerges next month (when the Iran sanction come into force on 4th November 2018) on the actual supply/demand balances. What are the markets’ concerns? Oil prices had been rallying till the first week of October (for seven consecutive weeks) on concerns that the looming U.S. restrictions on Iran will squeeze supply at a time when production is already being affected because of geopolitical supply disruptions coupled with temporary Permian pipeline shortages. Added to that is the ongoing crisis in Venezuela, which has led to a massive fall in its oil production. The rise of Brent past the $86/bbl on 3rd October 2018 forced a rethink among analysts, including us, on the future trajectory of oil prices. While we are not in the camp of analysts predicting oil prices would reach $100/bbl level, we believe that prices are unlikely to reverse much from the current levels (at least in the near term). That said, our trend analysis of previous oil price hikes suggest that the current rally may loosely follow the trend seen in the 2009-2011 rally (lasted for about two years and four months). This could suggest some more upside in prices but if we were to go merely by the time taken from trough to peak, the uptick might just be hitting a ceiling. Officially, the meeting in Algiers between OPEC and the non-OPEC partners (on 23 September 2018) ended with no decision to increase oil production. But, recently both Saudi Arabia and Russia have signaled that they may pump more amid growing pressure from the U.S. President Donald Trump. Any unforeseen production outage would then present serious problems to global supplies. There could also be pricing impacts as dwindling spare capacity is likely to provoke more volatility in the oil prices. While concerns on the supply side are fairly well known by now, the demand side of the equation looks fuzzy. Demand might look strong now but may soften as we get into the fourth quarter and beyond on the back of an emerging Markets turmoil, lingering trade related skirmishes and natural demand destruction that may naturally follow the current rally in oil prices. Overall, it seems to be a difficult balancing act for the oil markets with no clear answers. For now, the market looks tight over the next couple of months until further clarity emerges on both the supply and demand side of the overall equation. Until then, prices may remain highly volatile. We expect oil prices to hover broadly in the $78/bbl – $85/bbl range with risks tilted to the upside. How much can oil prices rise beyond the $85/bbl? There are three factors that may determine the oil price trajectory in the coming months.1 One, the actual loss in supply due to sanctions on Iran. Two, the extent to which OPEC and NOPEC members may fill up the gap and, third, the impact of trade wars and current weakness in the financial markets (especially EM) on actual demand for oil. The Iran factor – how much of it is priced in? Tentative estimates suggest that Iran may have already lost about 1.0 million barrels per day in oil exports, compared to the pre-sanction levels. While India and China (which account for almost 50% of Iran’s oil exports) have previously stated that they would not stop buying Iranian oil, recent media reports suggest that China has already cut its imports from Iran. Although India maintains that it will not bow to US pressure, some cut back on its Iranian oil purchases, going forward, cannot be not ruled out. It is, therefore, safe to assume that the full effect of sanctions is yet to be realized in the current oil prices. Based on our estimate, further supply loss from Iran could be around 1.0 – 1.5 million bpd from the current levels. Of course, ‘under the table purchases’ (which is a usual phenomenon in such times) could partly ease the pressure. The second question that logically follows the first one is how much can the OPEC and non OPEC fill the gap for the expected loss in Iranian oil exports? The Joint OPEC-non-OPEC Ministerial Monitoring Committee held in Algiers on 23 Sept’18 was very important in this regard. While the participants have not committed on any immediate production increase in the meeting, Saudi Arabia and Russia have signalled that they will tap in their spare capacities, were the market to require so. Saudi Arabia is currently producing at about 10.7 million barrels a day, and it can add a further 1.3 million bpd (as per official announcement) from its spare capacity to take the production to 12 million bpd, a level which Saudi has long claimed it could produce and sustain. However, what’s worrying from market’s perspective is that the Saudi Arabian oil minister Khalid al-Falih said that the country would spend as much as $20 bn just to be able to provide the next 1 million bpd of spare capacity beyond the 12 million bpd. This naturally casts doubt on whether the current spare capacity will be sufficient going forward and whether it could come online soon enough without incurring humungous costs. Russia, meanwhile, added 0.15 million bpd in September, pushing output up to a new post-Soviet record high at about 11.35 million bpd. Further increase from these levels could, therefore, be limited to the tune of 0.2 -0.3 million bpd. Moreover, over using the limited spare capacity could prove to be a double-edged sword: even though prices may cool down for the time being, the impact could be limited by the risk-premium as the market factors in the thin buffer that will be left afterwards. Low spare capacity creates a lot of price risk in the event of additional outages, which are quite regular in places like Libya and Nigeria. That said, there are some unknowns which can potentially come to the rescue. For instance, the Neutral Zone oil fields on the Saudi-Kuwaiti border (often not included in spare capacity estimates), which could produce as much as 500,000 bpd may potentially come online. Others within the OPEC may also come to the help. The United Arab Emirates is bringing forward the expansion of the offshore Umm Lulu and SARB fields, which could pump 129,000 barrels a day by the end of the year, up from 50,000 barrels a day now. Iraq too has ramped up production over the past few months by bringing on stream the expansion of its Halfaya oilfield. 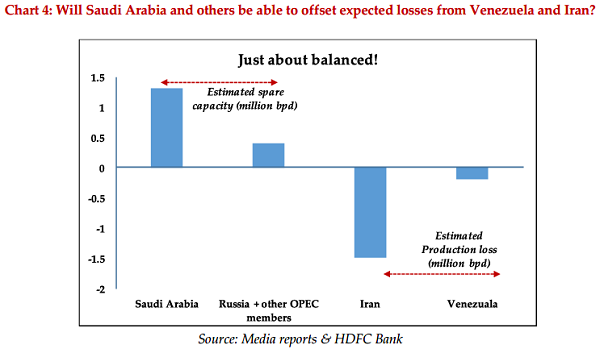 So, overall, Saudi Arabia has about 1.3 million bpd, Russia could add another 0.2 million bpd and the rest of OPEC (minus Iran) would probably be able to manage another 0.1 – 0.2 million bpd to fill the loss of supply coming from Iran (estimated at about 1.5 million bpd). So far so good! But add the potential loss from Venezuela (about 0.2 – 0.3 million bpd) to this and we get a trickier situation. What about shale? While the U.S. shale has the capacity to ramp up production going forward, pipeline bottlenecks in the Permian basin (which could extend to other areas such as the Bakken or the Niobrara) are likely to prevent the increase to come in anytime soon. Moreover, drillers in the fastest-growing oil region in the US face infrastructure issues beyond just the limited pipeline takeaway capacity. For instance, Permian oil producers need a lot more electricity to power well production than they did just a few years ago. And the West Texas electricity grid (that supplies in the basin)— which was not planned for so heavy a load—is struggling to catch up with the power demand. Infrastructural constraints are expected to be alleviated only by second half of 2019. The impact of the additions in rigs this year also won’t help immediately because of the long lag between adding rigs and seeing a production response. The demand side of the equation is much more complex and harder to pin down. The ongoing meltdown in global equities perhaps reflects investors’ concerns on the health of the global economy. Rising interest rates, trade related headwinds, political turmoil in certain economies, a strong dollar and emerging market (makes up the bulk of oil demand growth) weakness are all factors that may undermine global growth and in turn aggregate demand, going forward. Quite unsurprisingly, the International Monetary Fund has cut its global economic growth forecasts for 2018 and 2019 to 3.7% from 3.9% for both years. around 50 tbpd from its previous estimate. Additionally, demand for oil in the coming months may soften down if the winters turn out to be less severe than the usual. One must also take into account the process of natural oil demand destruction that usually follows periods of high oil prices. *Mr. Abheek Barua, Chief Economist, HDFC Bank. Mr. Barua tweets at @AbheekHDFCBank.